Dr. Reznick’s most recent book is John Galsworthy and Disabled Soldiers of the Great War, which was published in 2009 by Manchester University Press. Details are available in the Books section of this web site. 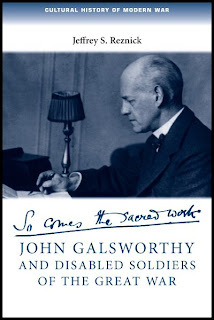 With an illustrated selection of writings by Galsworthy, John Galsworthy and Disabled Soldiers of the Great War represents the most comprehensive study written to date of his humanitarian support for soldiers disabled in the Great War. 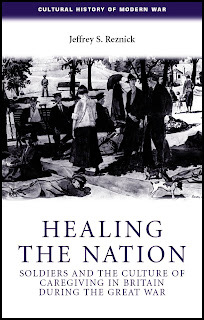 Dr. Reznick is author of two books -- John Galsworthy and Disabled Soldiers of the Great War (forthcoming, November 2009) and Healing the Nation: Soldiers and the Culture of Caregiving in Britain during the Great War (2005) -- both of which appear in the Cultural History of Modern War Series of Manchester University Press and are distributed in North America by Palgrave Macmillan. Dr Reznick’s record of historical and related research is as extensive as his career in the nonprofit sector. He has been awarded research grants from the National Endowment of the Humanities, Reynolds Historical Library of the University of Alabama at Birmingham, and The Wellcome Trust (declined). Dr. Reznick is an Honorary Research Fellow in the University of Birmingham's Centre for War Studies and an elected fellow of the Royal Historical Society of the United Kingdom. In addition to authoring two books published by Manchester University Press, Dr. Reznick has written several original essays in scholarly collections, numerous analytical histories in scholarly reference works, over a dozen book reviews in scholarly journals, and a number of historical pieces for popular audiences.